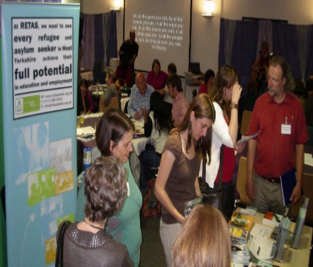 From 2010 UPA worked with a number of different projects to help run 4 City wide networking events called Connect. 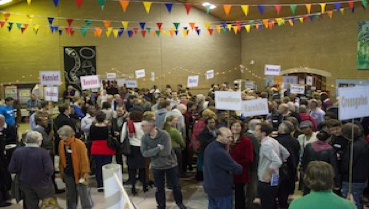 Each event brought 200 plus people from a range of different ages, postcodes and cultures to each event. 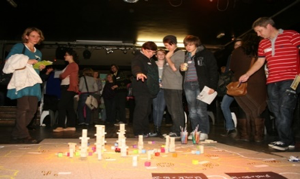 As well as providing Stalls, food and space to network each event had a specific focus. Held at the St George’s centre saw the launch of the Sidelined DVD. This 33 minute DVD documents 9 different initiatives which were and in many cases still serving marginalised people in Leeds. UPA was able to support Leeds Churches Together in Mission (LCTIM) in the making of the Sideline DVD. Connect 2011 was held at a music venue called the Wardrobe and saw Andrew Grinnel deliver a vibrant presentation on inequality in the city. He used a floor map of Leeds with different shapes e.g Jengar Bricks to show areas of deprivation and wealth in the City. This event was held at what is now City of Leeds Academy. Like in 2011 we had a map of the city, only this time it covered most of the floor. The main part of the event focused on connecting people with other Christians in the same geographical area, whether it be where they live or worked. Connect 2013 saw the event carried out at Living Hope Church. The main part of the event was something called Open Space which enabled people with similar passions and to engage in group conversations. Since this event we have seen two Prayer initiatives formed, one called Mahabba and the other was the creation of Pray for Leeds (P4L) and the 24 hour time of prayer.